For me my tanking UI is the same as my normal raid UI. The only difference are the different buttons that come with a dual spec swap. Those buttons are crucial, and I don't feel like I'm using them as effectively as I could. I leave thunderstomp on my pet bar. This seems like a poor choice... and it leaves less room for Last Stand and Taunt... as well as Growl and Cower ... which I still keep on the cast bar to keep them set correctly. So I moved Mend Pet, Intimidation, and BW in amongst my number keys. Other than Thunderstomp (which I may merge with BW) what should I have there with my normal shots? They need to rework the pet bars so that we can put any of the pet abilities in any slot. We should be able to put any pet ability in any of the spots on the pet bar. It just doesn't make sense that we always need Attack, Follow, Stay, Agressive, Defensive, and Passive on the pet bar. Hmmm....perhaps a UI mod is in order here. Well, with macros and a bar addon you can replicate a pet bar, but have any abilities that you want on it. Yeah, I use bartender 4. But I hate burning one of my bars for pet junk. I have a pet bar with 6 buttons that I'd rather be using for other things. Hehe, busy, not messy. I have a lot of empty pieces of the 8 bars, but the pattern of buttons I have in the bottom right corner of my screen means I don't have to focus on and identify the icons. Oh ya, and it's 10 bars, not 8. Took this screenshot on patch day a couple weeks ago, so its missing a few addons that I hadn't yet updated. Omen is normally above the chatbox on the left and Recount of the right side just above the tooltip. Also this is actually my BM PvP setup, but with the exception of putting Eyes of the Beast on that empty spot on my bars (I take it off for PvP so I don't accidentally start channeling it when I go to hit Intimidate), a row of giant pet buttons for Taunt, Last Stand, Shell Shield, ect, and the addons, they're basically the same. As for the Archavon, as you can see by the chat box the only one I altered was the MT. It was a guild run, and the others figured it out anyway and were talking about it in vent as soon as they saw Bubbles. It actually went fine until Bubbles got picked up, and by the time he got put down he was way too far back on threat and since it was a spur of the moment thing I didn't have him talented for Taunt. I had Panzer helping offtanking adds for Emalon (for the record, Pet Taunt *does* work on those) and decided to leave him on for Archavon, since we had moooooore than enough DPS and I wanted to test. Knowing our tank is quick on taunt and that Panzer could handle a couple of smacks, I attempted to taunt Archavon. I don't recall seeing an 'Immune' from SCT, but he didn't pay any attention to Panzer. So either the tank taunted at the same time I did and 'won', or he's immune. My UI is the same as my DPS setup for where my bars and such are, but I have a few of the skills moved around. For example, where I usually have Misdirect (keybound to 'P'), I have a simple macro that auto-casts MD on Panzer (or on whatever pet I have; cast=pet). Where I normally have my pet's Thunderstomp (yes, I do occasionally DPS with my Tenacity pets, and I don't always want them TS'ing if there's CC around), I have Taunt (because TS is autocasting). Other than those few small things, though, the controls are pretty much exactly the same. Not the case when I raided Survival and tanked BM, naturally (I raid BM nowadays; I'm a rebel... and we need the FI). Boss adds are not immune, Blizzard even stated that when they changed Taunts. They called it Lieutenant level mobs or something. Yeah leuitenant level mobs is blizzard's term for anything that comes on the scene in a boss fight that actually has any kind of damage or health. 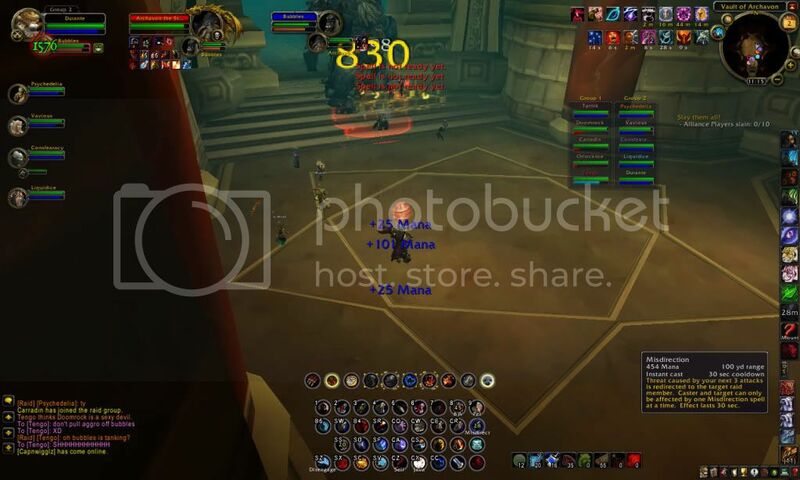 The term has been used several times when they talk about pet tanking, including the 'manifesto' post in which they laid out the 'scope' for pet tanking.